"The Deepest Rift," my science fiction story about exploring alien worlds, translation error, and the perils of academia, went up this afternoon at Tor.com. This story comes with a story, and a giveaway. Way back in 2010, it was Saturday and I was at Wiscon. If you go to the Journeyman Writer's meeting, you miss the lunch break, and I hadn't yet learned the "send your spouse for sandwiches" trick. So I snuck in late to "The Story in the Object, The Object in the Story," and hid out in the back of the room trying not to make my crumbs obvious while elisem, Catherine Crowe, and Kat Byer talked about similarities between art forms, the way we use art to create relationships as well as make (or fail to make) a living, and the importance of sometimes giving things away. Elise passed around an amazing tektite, and Catherine showed off beautiful copper bowls. Towards the end, Elise was talking to Ellen Klages (in the audience) and told her that she knew what to do with that project they'd been working on. She asked for six volunteers. I'm not an idiot: I raised my hand. She then told us that a couple of years previously, they'd done a collaboration: Ellen found stones, Elise made pendants of them, and Ellen named them. We'd each get a random pendant, to be picked up later in the con, and make something else with it or based on it--and then pass it on again. For those of you who don't know Elise's work, she's a professional muse. Go click through onto her LJ--her sticky post shows everything she's currently got available. Every item has a title. Many have stories hidden in them, or poems, or major life changes. I could see right away the sides of the unimaginably deep canyon, the forests down in the dark, the wind that swept up over it carrying strangeness from the mist below. But it was not only story, but also oracle: at the time I was just starting to feel my way towards leaving academia, and routes and detours and the question of whether it was even possible to get to Point Q from where I stood were very much on my mind. I started writing almost immediately, but stalled out for a couple of years when I solved my real-life dilemma before finishing the story that I was using to map it. (This was a good problem to have.) Last year I finally figured out what was missing, sent the story out to Carl at Tor.com, and here we are. And so now I'm finally done with the pendant, and I will miss it but it needs to find a new home where it can keep doing its job. - A brief, true explanation of what you'll make with it. The explanation doesn't need to be complete--"My story needs plot bunnies" or "trying to make a path through a crisis" are as good as "I'm on a quest to find the holy grail, the latest clues lead me to believe it's in the grand canyon, and this looks like something that will help me find my way." - A promise that you'll pass it on when you're done with it, to someone who will keep the same terms. This doesn't need to be quick; I've had it for five years, after all. - A way to contact you if you aren't posting with an LJ handle. On Monday, I'll pick a name via random number generator, because I am not myself an oracle, and will contact the winner for mailing information. Disclaimers: Mailing times dependent on the vagaries of baby and DC snail mail system. Not responsible for lost, misdirected, or temporally displaced merchandise. Device may not operate as intended. Effects may not be synchronous. I was recently visited by The Fool, so clearly I'm about to start a journey, but I have no idea where I'm going, much less what detours are available. I really would prefer detours to falling off cliffs. 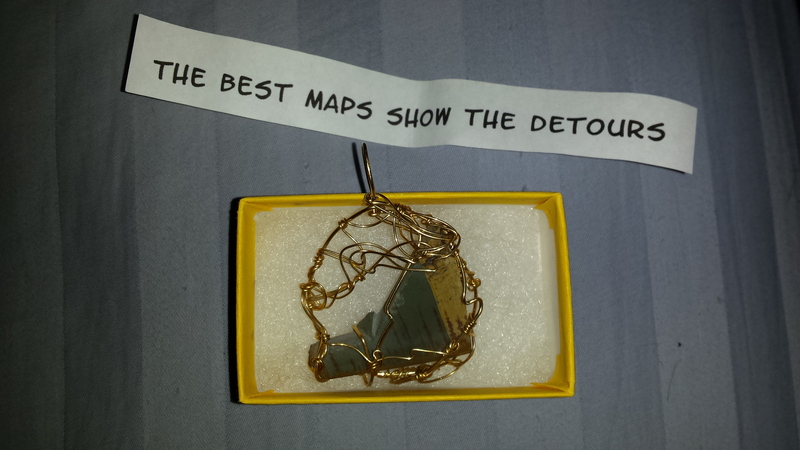 I faithfully promise to pass it on to someone else who needs a map when I'm done. I can be contacted via livejournal or at madgastronomer@gmail. I debated about whether or not I should post, but then I saw the tikkun olam tag, and, well. Last year at Yom Kuppur, my rabbi passed out cards and asked us to anonymously write down something for which we wanted to forgive ourselves. Mine was "for allowing my identity to be subsumed by the needs of others." The past year has been an intensely challenging one. I've survived it, and more importantly, I'm learning to thrive. But I never expected to be where I am today. When I was in my teens, I felt intensely pulled to do SOMETHING with music for the rest of my life. I debated applying to Juliard or Berkeley, and I probably could've gotten in. But it didn't feel right. I ended up wandering aimlessly instead. Yesterday I finally figured out what I was supposed to have done with music in my life... but that clarity came 15 years and a young child too late for me to be able to answer the call to the cantorate. I don't begrudge having ended up where I am. I like who I am and I love the people who are in my life because I didn't know how to get onto the path I was supposed to take. But I'm still being summoned, and I have no idea how to go about answering that call now. If the oracles of randomness say that this pendant should come to me, I promise to listen to what it tells me about making music and healing the world, and I likewise promise to pass it along to someone else once I've figured out where I'm going. Kythryne at gmail is the best way to reach me. Mazel tov on your story! I have bookmarked it to read later. I will fairly soon be writing two novels at the same time-- I will alternating work on them session by session, because one of them is so distressing in subject matter that I can't be in the headspace required for it for any long amount of time without doing myself damage. I have a hat, a literal actual hat that I went out and found, that I will wear when I work on the distressing one. This pendant would be perfect to wear while working on the lighter one; it has the correct feel and the mountains. It would be very helpful to have something to differentiate the two even further. And, of course, I'd pass it on. I know how these things need to go. I make books. I've had a mostly-hiatus for the past 3 years because of a masters degree taking up most of my spare time. I would love to find my way back to a place where I have the creative time and space to make books again. Also I am trying to learn from Elise's mastery of words and names as this is a thing I'm terrible at. I would use the map for inspiration to create a book and get myself back on the path to creating regularly. And I promise I would pass it on - this inspiration is meant to travel! LJ messages are a fine way of reaching me.